Hochwertiges Alleinfutter in Tablettenform speziell für Zierfische, die in Bodennähe leben, z.B. für Welse, Schmerlen und gründelnde Barben. Mix aus roten für vorwiegend carnivore Fische, und grünen Tabletten mit höheren pflanzlichen Anteil. The red tablets ensuring by their balanced mix of nutrients, minerals and trace elements, a healthy, full and easily digestible diet. They promote the vitamins contained in the well-being and strengthen the immune system. Suitable as a staple food for all carnivorous (meat-eating) fish. The green tablets ensuring through their balanced mix of nutrients, minerals and trace elements, a healthy, full and easily digestible diet. They promote the vitamins contained in the well-being and strengthen the immune system. 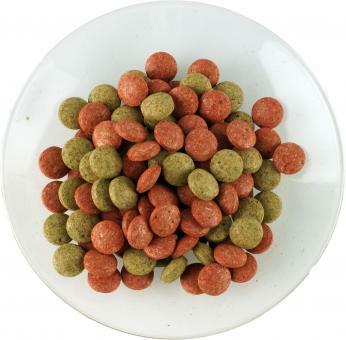 Suitable as a staple food for all herbivorous (plant-eating) fish. Several times a day to feed as much as your fish will take a few minutes. good product for ground fishes. Always a help in nutrtion. High quality and good price. Ancistrus and corydoras like it a lot.